Holland Gas Grills Dealer Buffalo NY | Pools Unlimited Inc.
We'll make you the BBQ King (envy) of the neighborhood! The Made in America Holland Grill - grills moist, delicious food every time - hassle free. 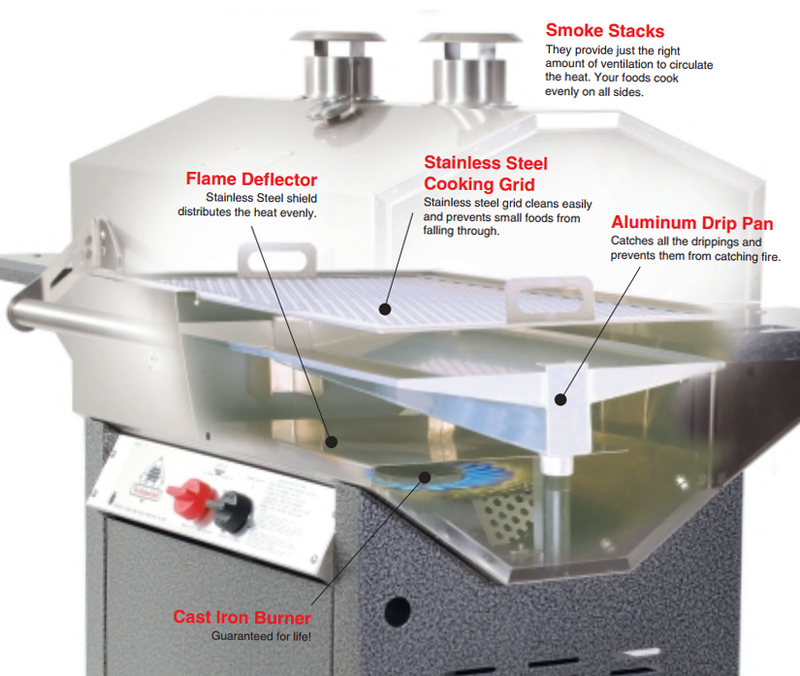 The exclusive, patented Holland Grill System with it's drip pan enhances your foods flavor and prevents flare-ups. What makes the holland grill better than the rest? the design! In the 1970's Brad Holland started a side business cooking pigs - but found that he had to watch over them so they would not burn. So he decided to improve the grill to eliminate the flare ups and burned meat. After many years of trial and error, and many variations - over 60 in fact - Brad Holland developed a grill that bears his name - the Holland Grill. Here is a view of the inside of the Holland Grill. The Holland Grill "System" is a group of 5 components that make the Holland Grill unique. Starting at the bottom is the CAST IRON BURNER - which is located in the bottom center of the grill. The next component from the bottom is the FLAME DEFLECTOR - which is positioned above the burner. The deflector spreads out the heat to reduce hot spots. Above the deflector is the ALUMINUM DRIP PAN. The drip pan catches the grease drippings - keeping them away from the burner - thus no flare up! The drippings sizzle up off of the drip pan - giving the food that distinct Holland Grill flavor. The drip pan doubles as a liquid holder - water, beer, apple juice, au jus, etc.. - this allows you to steam food on the Holland Grill. Above the drip pan is the STAINLESS STEEL COOKING GRID. With its diamond shape hole pattern, you can grill cut up vegetables and smaller foods directly on the cooking grid - without worrying about the food falling through the grid! The 5th component of the Holland System is the SMOKE STACKS. The stacks allow air to circulate around the inside of the grill so your food cooks evenly on all sides - no need for a rotisserie. If you are interested in the Holland Grill, and would like to sample some food cooked on the grill, stop in to one of our "Demo Days" - where we cook a variety of foods on the Holland Grill. Click here for "Demo Day" dates. Unrivaled! Stainless steel and aluminized powder coated metal construction provides a lifetime of durability. The best grill money can buy. NuStone side shelves, thermometer, igniter and our heavy duty cast iron burner. The cabinet design with access door makes it easy to get to the LP tank and allows room for storage of BBQ tools. Made in the U.S.A., Holland Grills cook food more thoroughly than any other barbecue grill on the market. The Holland Grill uses a unique indirect grilling technique that eliminates flare ups and prevents your food from burning on the outside, while still being raw on the inside. The unique design allows you to "set it and forget it". You pre-heat the grill, add your food to the cooking grid, close the lid and cook by time! This allows you to grab a cold one and relax - and visit with friends and family. If you want a gas grill that's simple to use, and grills the most tender and juicy food you've ever tasted, then the Holland Grill is what you're looking for. Why are Holland Grills more expensive than some other grills on the market? Can you smoke food on the Holland Grill? Can you steam food on the Holland Grill? What types of foods can you cook on the Holland Grill? What is the care and maintenance on the Holland Grill? What is the purpose of the bucket? What is the purpose of the smoke stacks on the Holland Grill? What is the largest Holland Grill? Why does the Holland Grill only have one burner? Does the Holland Grill sear? Why are the Holland Grills more expensive than some other grills on the market? Holland offers grills starting off at $699, and each of the grills features the patented Holland Grill "Cooking System" - a unique system to control the heat and prevent flare-ups. Meat juices catch in the aluminum drip pan and smoke back up to flavor the meat. Excess juices are directed away from the flame and catch in a bucket under the grill. Yes. You can turn off the ball valve below the drip pan and fill the drip pan with water, wine, beer, apple juice, or another type of liquid. The liquid will steam up to moisten and flavor the food. What types of food can you grill on the Holland Grill? You can grill all of the traditional "grill" foods - hot dogs, hamburgers, chicken, ribs, etc... plus you can grill a variety of other foods including whole turkeys, whole chickens, pork loins, beef briskets for pulled pork, pizza, apple pie, sea food - the list is limitless. What types of care and maintenance are required on the Holland Grill? The Holland Grill is really pretty simple to care for. The main care for the grill is to periodically clean the drip pan. The simplest way to clean it is to heat the grill up, and then use the wide scraper to scrape the drip pan - freeing accumulated grease, once the large parts are clean, then you select the small scraper and scrape the middle channel. Once the drip pan is cleaned, then you can brush off the stainless steel cooking grid. That is it for cleaning the cooking area. The carts/cabinets are easily cleaned with a sponge and some water. The bucket collect excess grease that is not sizzled up into the food. What is the purpose of the smoke stacks? The smoke stacks allow the heat in the grill to circulate around the food to cook the food evenly all over. The advantage of this method is that you don't require a rotessierri to cook large foods like turkey or ribs. On the Holland Grill, you place the turkey on the cooking grid, in a pre - heated Holland Grill and cook by time. What is the largest Holland Grill. For most families the main Holland Grill line provides enough cooking area. 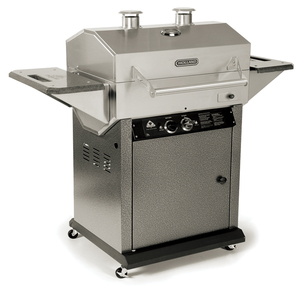 In the event you need more cooking space, Holland introduced the Pinnacle Grill, which is approximately 2 times the size of the regular line Holland Grills. Why does the Holland Grill only have one burner. All you really need is one burner. 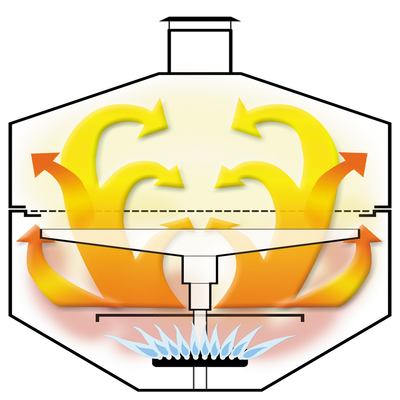 The Holland System which consists of the cast iron burner, flame deflector, drip pan, and smoke stacks - allow the heat to be constantly circulated around the food in the grill- cooking the food all over. The heat system in the Holland Grill is more like a convection oven, thus you don't need many burners. Does the Holland Grill Sear food? Since the Holland Grill cooks at a lower temperature, it does not "sear" in the traditional sense. The food that comes off of the Holland Grill is moist and juicy. If you truly like your food "seared", Holland offers the Sear Mate, an add on for the Holland Grill which can sear the food at either 600 degrees or 900 degrees if desired. "I am 68 years old and I absolutely "love" this grill. I can cook on this grill without any watching or worrying about it flaming up. The food I cook is wonderful and I recommend this grill to all my friends." "As far as we're concerned there is only one grill, the Holland Grill. As you say, nothing stacks up to a Holland Grill. Thank you for manufacturing such a great grill. We would purchase another one in a second." "If you want a fast steak, this is not the grill, but if you want the best tasting steak, chicken, turkey, roast, ribs, fish, oysters...this is the best grill I have ever owned. After approximately $2,500+ in worthless, non-lasting grills, I spent $1,000 for the best grill on the market. Thank you Holland Co."
© 2019 Pools Unlimited Inc.